Satao II, one of Africa’s seven oldest and largest elephants, has been found dead in a national park in Kenya. The killing of one of only around 25 so called “super-tuskers” is being blamed on poachers. The carcass of 50-year-old Satao II was spotted by Tsavo Park rangers during routine aerial reconnaissance on Monday and was later found to have a poisoned arrow embedded in his body. The park measures 16,000 square miles (42,000 sq. km), an extraordinarily difficult area to patrol effectively. Two rangers have been killed in the last month, trying to fend off poachers. 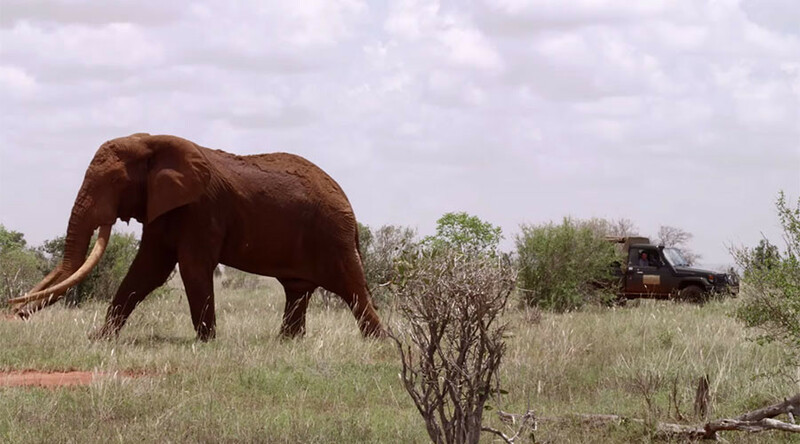 "Luckily, through the work we do with the Kenyan Wildlife Service (KWS), we were able to find the carcass before the poachers could recover the ivory," Richard Moller of the Tsavo Trust told AFP. Tragic News to report from #Tsavo, #Kenya…. One of the last giant tuskers left in #Africa, #Satao2, has been poached! Named after the magnificent #Satao who was poached in 2014, this is absolutely devastating to the conservation world and a huge loss for this iconic species. RIP Beautiful Satao 2 Photo 1: Credit Tsavo Trust – Satao’s carcass Photo 2: Credit – Dex Kotze – Beautiful Satao 2 – will be sorely missed! #Elephants #Tuskers #WorthMoreAlive #SayNoToIvory #GMFER2017 Please read further via: Africa Geographic “SATAO 2 is dead, and another of the last tuskers left in Africa has been poached, leaving only 6 of these giants in the #Tsavo Conservation Area in southern Kenya. This is a devastating blow to elephant conservation and to super tusker genes. SATAO 2 was named after SATAO, the iconic giant who was poached in 2014 and was one of the largest tuskers left on Earth. A ‘tusker’ is an elephant whose tusks each weigh in excess of 100 lbs / 45,45kg. The tusks of Satao 2 weighed 51kg and 50.5kg. Kenya Wildlife Service (KWS) rangers discovered the gruesome kill site before the poachers had the time to remove the tusks. Although not totally certain, indications are that SATAO 2 was killed by a poison arrow. In subsequent investigations, two people have been apprehended and weapons seized. KWS continues to work hard to rid Tsavo of poaching teams that roam the reserve. The massive 44,000 km² Tsavo Conservation Area (twice the size of #SouthAfrica’s #KrugerNationalPark) is home to the highest population of large-tusked elephants in the world, with 6 ‘super tuskers’ (of approximately 25-30 in the whole of Africa) and 15 emerging tuskers (young bulls who have the genes and potential to become tuskers). There are also 7 cows with tusks reaching the ground that are being monitored. In the past decade, elephant populations have fallen by 111,000 to 415,000, according to the International Union for Conservation of Nature. Tuskers are elephants who boast extremely large, and thus valuable, tusks, often in excess of 80lbs (36kg). Ivory reached prices of up to $1,100 per kilo on the black market as of November 2015, but with a ban being imposed in China this year prices are expected to fluctuate. Satao II’s predecessor Satao was killed in 2014 and was believed to be one of the largest of his kind on Earth at the time. Two suspected poachers were taken into custody thanks to the quick work of the park rangers. "I am pretty gutted, really. This particular elephant was one that was very approachable, one of those easy old boys to find. Many are the others are much more difficult to see," Moller told AFP.